Another 10 in the bag. After a days delay due to God smiting the power int he theatre, Dedfest X finally started last night. So BLUE titles are ones seen in the theatre. 337 10/17 Evil Ed (1995) 2.5/5 A meek film editor gets assigned to cut horror and it has an effect on him. It’s gooey and an excuse to have fun with horror tropes, it just didn’t work for me. 338 10/17 Madhouse (1981) 2.5/5 A teacher for deaf kids gets stalked by her evil twin sister. Or is it in her head? Pretty typical slasher for the era that adds in a killer dog but none of it is particularly interesting. 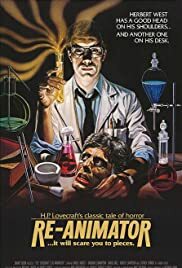 339 10/17 Re-Animator (1985) 4/5 First time watching the integral cut. Herbert West thinks he’s Baron Von Frankenstein. I prefer the shorter cut as I find the added bits in this kill the pacing a bit. Still worth a watch or three. This one is a classic deserving of all it’s cult fandom. It’s also the right way to have comedy in a horror film. Play the horror straight and the comedy comes from the situation. Makes this one a delight and the Arrow Blu-ray set is suitably gorgeous. 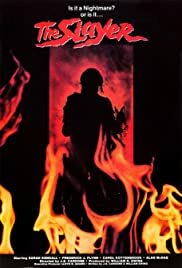 340 10/18 The Slayer (1982) 2.5/5 A woman appears to be cracking up from stress so her husband takes her with some friends on a vacation. Some nice gore can’t help this one, despite being more ambitious than the typical slashers of the era. It plays it pretty straight but I found it draggy. 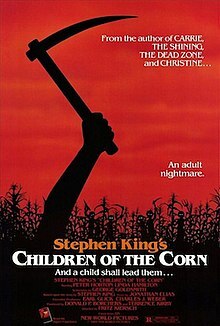 341 10/18 Children of the Corn (1984) 3.5/5 Small town kids discover religion and the parents don’t like it. This one will never go down as the greatest Stephen King adaptation but it works. It’s been too long since I read the original short story so I can’t comment on how close it is, it simply works as one of the better creepy kids/Village of the Damned type movies. 342 10/18 The Zodiac Killer (1971) 3.5/5 It’s absolutely bananas that prior to the Fincher film Zodiac, this was the best telling of the Zodiac story. It’s not actually a “good” picture, it’s cheap beyond belief, spends too much time on a red herring and then goes off on flights of fancy. When it does stick to the facts, it’s kind of effective. That expert Paul Avery backed it just shows how scared everyone was at the time, they producers thought it would help catch the actual killer. Viewing it now, it has a goofy charm. 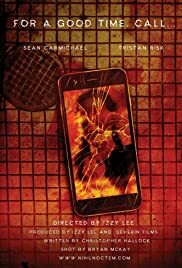 343 10/18 For A Good Time Call… (2017) 2.5/5 Short film about a douche-bag who secretly films a tryst and suffers the consequences in an extreme way. It’s good for what it is, but I tend to find that horror shorts tend to feel more like demo/audition reels than proper stories. 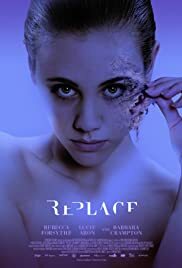 344 10/18 Replace (2017) 3.5/5 A young woman deals with bad skin problems in a icky way. An interesting play on beauty expectations, and a great play on body horror. It goes for a bit of a wander in the last act but the stuff leading up to it is great. 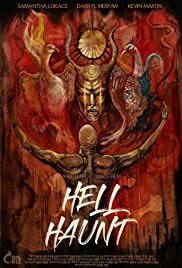 345 10/18 Hell Haunt (2017) 3/5 A short filmed in my hometown of Edmonton about a killer replicating murders at a horror movie premiere? Maybe? I have to admit, I couldn’t follow it. It was damned pretty and well executed which I guess makes it a success. Have I mentioned that I find horror shorts to feel like demo/audition reels? 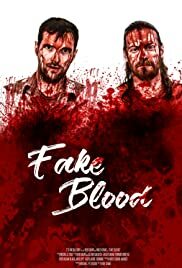 346 10/18 Fake Blood (2017) 3/5 Documentary about a pair of amateur filmmakers exploring if exploiting violence on screen can affect people to commit violence in real life. It’s well done in that it doesn’t feel like a fake documentary, but it’s also not as clever as it thinks it is.